An extraterrestrial threat to existence, be it an impending asteroid strike or an intelligent being's announced intention to do harm to the earth, would probably be required these days to invoke the sort of voluntary personal sacrifices of today's average citizen that was exhibited in the enthusiastic, patriotic response by Americans to the 'V' for Victory campaign during World War II. You no doubt have seen pictures of kids pulling wagons filled with metal scrap, rubber tires, and glass milk and pop bottles collected for the war effort, and pickup trucks piled high with sections of pipe, car parts, and retired furnaces. Resources were relatively scarce at the time, and material was being consumed very quickly in the effort to beat back the aggressive advances of Axis forces throughout Europe, northern Africa, and the South Pacific. 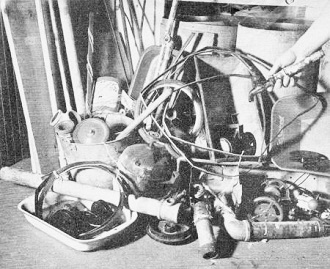 This article from a 1942 edition of Radio Retailing Today encouraged radio repairmen to check with customers during service calls for any available scrap items that could be hauled back to the shop for donation. "The loss of one percent in our production of steel, for example, is immediately reflected in the arming and supplying of necessary material to our fighting forces." "Precious" junk like this can be picked up from the average radio home. One of radio's Victory jobs is the prompt and efficient collection of all scrap materials within the limits of the industry. The War Production machinery of the nation needs it badly, and the situation invites the energetic interest of everybody in the radio business. Donald Nelson of WPB, in his currently "tough" mood, has declared that the collection of scrap is today as important as any problem we have in this country. He has made it clear that there must be a sharp acceleration in the coast-to-coast effort to "get in the scrap." The activities of the radio factories themselves are already being organized under the direction of Larry E. Gubb, chairman of the board of Philco Corp, Mr. Gubb works with the American Industries Salvage Committee, 350 Fifth Ave., New, York City, of which Robert W. Wolcott is chairman, and is contacting all manufacturers in the industry. The emphasis is on the collection of such critically-needed materials as iron and steel scrap, scrap rubber, non-ferrous metals, rags, manila fiber and other materials used in war production. Some radio manufacturers have already organized their plant personnel for important salvage drives and have collected great amounts of "waste" metal. The "mountain of metal" saved by salvage efforts at RCA plants is an example. Cooperating with the all-industry scrap effort, Radio Retailing Today is helping to enlist the efforts of the thousands of radio servicemen and dealers who contact the millions of radio owners to "Keep 'Em Working." 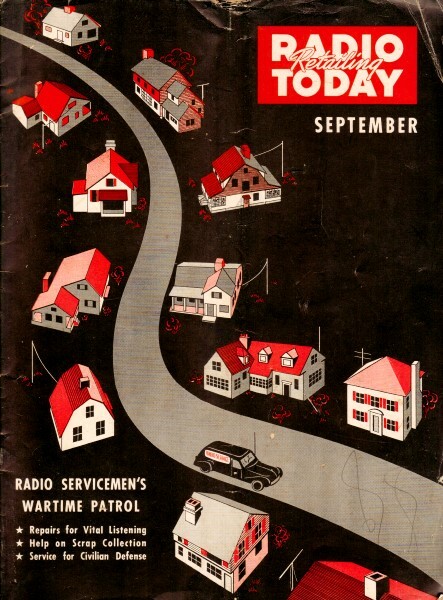 The suggestion is that local radio men clean up their own shops and homes; that they encourage the scrap collection idea in all the homes they visit on radio repair calls; that they use their trucks in hauling scrap whenever appropriate; and that they cooperate to the limit with all existing salvage plans and organizations already set up in their communities. "I am not exaggerating in the slightest, when I say that the collection of scrap is now as important as any problem we have in this country. If we as a nation, allow a single furnace to go down for lack of scrap, we should, everyone of us, have a guilty conscience. The loss of one percent in our production of steel, for example, is immediately reflected in the arming and supplying of necessary material to our fighting forces." 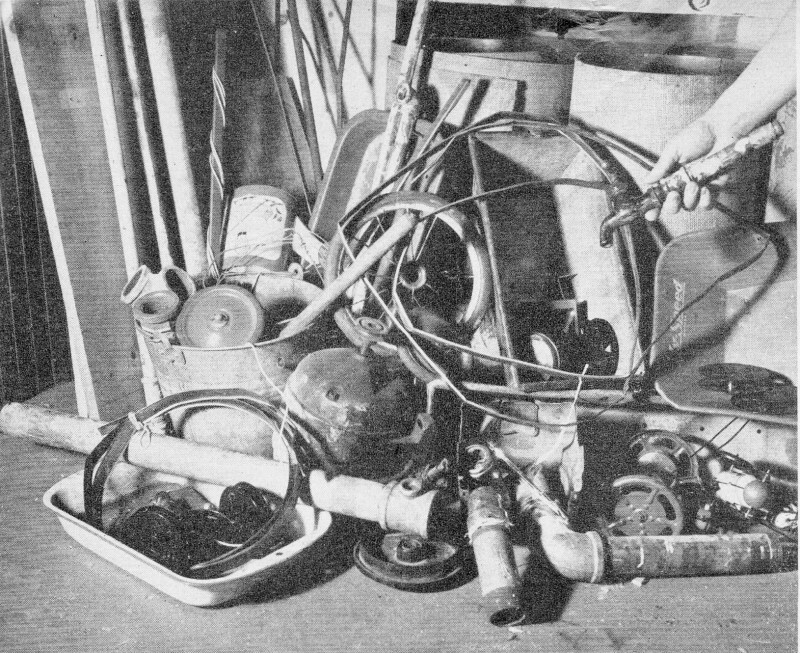 The idea is that the collection of scrap should become a part of the radio man's wartime duties - it should be a part of his wartime patrol as represented on the front cover of this issue. "The radio servicer can be Uncle Sam's right-hand man in the nationwide drive to get scrap metals and other materials out of homes, farms and business establishments and into the steel mills where it is drastically needed to keep the production of steel for tanks, ships, planes and guns running at capacity. Scrap iron and steel stockpiles have dwindled from the normal six weeks' supply to a 'two-weeks' supply. The War Production Board is swiftly organizing a network of Salvage Committees in industry, in farm communities and in town and cities, to handle the job of getting in the scrap. "What can the radio servicer do, over and above his own contribution of scrap materials? First, he can take on his personal patriotic responsibility of asking - at the home of every customer he visits - if there is not some metal or other scrap which the householder would like to have hauled down to the scrap collection center in the radio man's car, on his way back. Second, he can notify the local salvage committee of his willingness to give this special service - a service to his customers and to the scrap metal drive. "Inasmuch as production of new radio sets has been stopped by the Government, it is up to radio servicemen to do everything they can to aid the public by keeping existing sets in operation. Especially in wartime, it is important that every American family be able to keep informed of current developments, which they can no through the miracle of radio. In those cases, however. where sets are too old or obsolete to be repaired satisfactorily. the parts in them should be added to the nation's scrap reserve for service elsewhere in the war program."